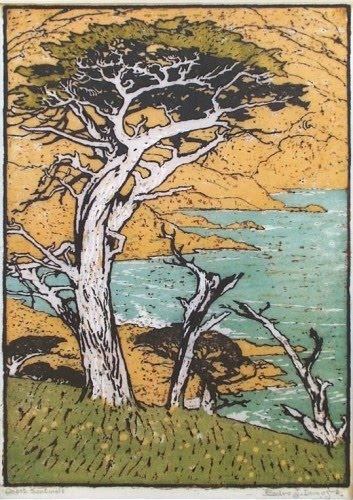 ‘Coast Sentinels’ by Pedro de Lemos is on display at the Stanford Art Gallery (Courtesy of Pedro de Lemos). Celebrating the Stanford Art Gallery’s 100th year, “Lasting Impressions of Pedro de Lemos: The Centennial Exhibition” offers a nostalgic glance through the work of former Stanford Art Gallery curator and director Pedro Joseph de Lemos. Running from now until Dec. 3 in the Stanford Art Gallery, the exhibition explores de Lemos’ central theories on color and design through his collection of etchings, pastels and color block prints. Born in 1882, Pedro de Lemos is considered to be one of the last great leaders of the American Arts & Crafts movement, an arts movement that focused on traditional craftsmanship and creation through simple forms. He served as a predominant and influential figure in arts education, design and applied arts, reviving printmaking and promoting regional artists throughout the first half of the 20th century. Following its donation in 1917, de Lemos ensured the Stanford Art Gallery would claim its place at the core of Stanford’s campus. Now, walking through the exhibition is walking through a slice of Stanford’s artistic history. Nature seems to quietly dominate the placid, rectangular space. The gallery initially appears overwhelmingly architectural, with its imposing pale blue walls and footsteps echoing off the beige tile floor. Yet each of de Lemos’ pieces, most about as large as a sheet of paper, acts as a tunnel into the bay’s forests, beaches and hillscapes. Strolling up to neatly arranged frames – most pieces are matted on bright ivory sheets outlined in dark wood – the delightful elegance and simplicity of de Lemos appears by surprise. Organic lines curve and swirl and prance, revealing the ordinary yet often ignored grandeur of the Bay Area’s landscape. Here, mysterious pastels and vivid prints trace the gallery walls, inviting visitors to peer into the window-like frames and absorb Palo Alto’s “poetry of color.” De Lemos’ work becomes almost dreamlike in quality, illustrating more with the colors of imagination than of reality. From the rich, azure birds against a gilded moon in “Sleepy Heads” to the chartreuse trees shrouded in hazy purple and blue sunset, each piece inspires a second glance at the campus’ locale – a search for its disguised charm. The choice of color, however, would not have its impact without de Lemos’ efforts in design theory. Taking inspiration from nineteenth-century Japanese woodblock printing, de Lemos distills objects to their core, leaving only their outlined essence on the canvas. In his own words, “design is simplicity.” Each frame contains only the few details needed for the viewer to understand the subject, whether it be the dappled bark texture on a tree or the meticulous silhouette of pine trees overlooking a desolate cabin. The tranquil rhythm and balance of each composition feels almost like a vacation from the chaos of campus life. Towards the end of the exhibition, two unassuming watercolors – “Russian River” and “Two Cows” – beckon from their wall. They appear almost art nouveau, another decorative art movement with focus on line forms and picturesque color, with their graphic black outlines and vibrant hues, distinguishing themselves from the rest of the collection. “Russian River”, like the rest, appears to be a surveying of the nearby landscape, despite its name. “Two Cows,” however, appears unfinished. Its cast features one cow drinking from a lake and another nearby cow staring wistfully outside the frame (given that cows are capable of staring wistfully). This pair, on its unpainted, fantasy-like stage, is perhaps the most enchanting of the collection. Exiting the building into the smoky, stinging air, traces of de Lemos’ images trickled out, appearing in the trees and architecture around campus (sadly, I found no cows that day). Mirroring de Lemos’ core design principles, the collection is a pleasant, simple stroll through the gallery’s past, reminding to delight in the nature surrounding this space. “Lasting Impressions of Pedro de Lemos: The Centennial Exhibition” is on display through Dec. 3 in the Stanford Art Gallery. Contact Julia Gordon at jmgordon ‘at’ stanford.edu.